This week on the podcast, we’ll be rounding out our “Meet the Team” interview series with Andrew, our Producer (and “one stop shop” decision maker!) here at the podcast. 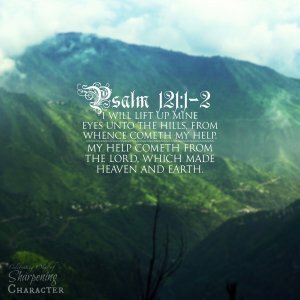 In addition, we have a special “tandem” CMOW segment as both Andrew and Ben discuss their thoughts from Psalm 121. All that and more, in this episode of the Sharpening Character Podcast! Tap or click the image to download it. Find the tablet version and previous editions here!